Efforts to address physician burnout may need to start as early as residency, a new JAMA study suggests. The results of one of two studies related on burnout published Tuesday in JAMA found 45% of second year residents surveyed reported having at least one symptom of the condition. 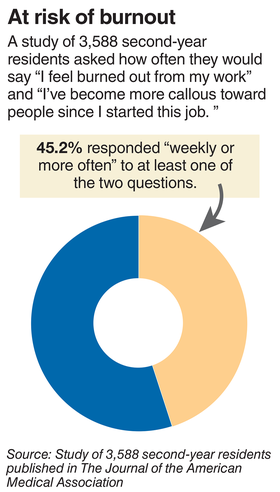 The survey of more than 3,500 second-year resident physicians found that 14% of those surveyed reported they would "definitely not" or "probably not" choose to become a physician again, while 7% of respondents indicated they definitely or probably would not choose the same medical specialty if given the chance to remake their choice. Study lead author Dr. Liselotte Dyrbye, a researcher at the Mayo Clinic in Rochester, Minn., said the study was the first of its kind to look at how factors such as high levels of anxiety and low levels of patient empathy reported by students during medical school were related to experiencing symptoms of burnout as they became second-year residents. "Burnout is really driven by work-related stressors, so perhaps medical students who are more empathic just have a different perspective or are seeing things differently in terms of how they deal with those stressors and how they ultimately impact their experiences," Dyrbye said. Resident physicians in urology, neurology, ophthalmology, general surgery and emergency medicine specialties reported the highest prevalence of burnout, while dermatology, pathology, radiology and family medicine residents had the lowest prevalence. Dyrbye said medical students who reported having higher levels of empathy and also higher levels of emotional support at the end of medical school were less likely to report regret about pursuing a career as a doctor or their choice of medical specialty. "We need to sort of figure out ways to nurture empathy and to help trainees build their social support," Dyrbye said. "But ultimately, the problem with burnout isn't because the medical student, or resident or physicians in practice is somehow defective in personal coping strategies—it is ultimately coming from the work and the learning environment, and that's really where attention should be focused in terms of strategies." Similar findings about the prevalence of burnout among younger physicians were found in a separate report released Tuesday by the advocacy group, the Physicians Foundation, which backed a study conducted by Merritt Hawkins thatfound 78% of nearly 9,000 physicians surveyed reported experiencing burnout in their medical practices. When asked, "would you recommend medicine as a career to your children or other young people?" 48% of physicians ages 45 and younger answered they would not. Dr. Gary Price, president of the Physicians Foundation, said issues involving increased administrative burdens and a loss of autonomy in the care of patients have left doctors with increased feeling of helplessness, which he said has led to lower morale and increased levels of burnout. He said addressing the problem though should focus more on making changes to the healthcare system rather than looking at ways of trying to make physicians more resilient. "The whole problem is a serious wakeup call for the whole healthcare system," Price said. "There are a number of factors that are making their (physician) work really difficult and affecting the quality of their output." 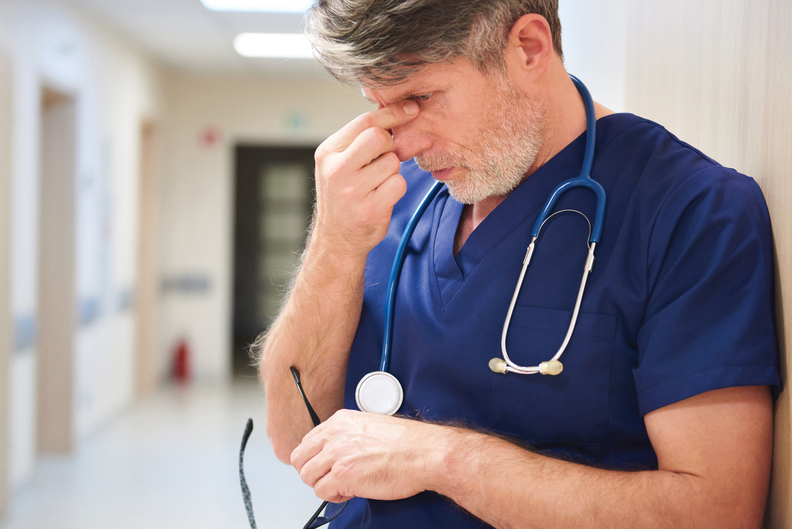 But working on solutions to the problem requires first knowing what the problem actually is, and to that extent, attempts to define burnout or how to measure its prevalence has been varied at best, according to a mega-analysis also published Tuesday in JAMA. That analysis found estimates of overall burnout reported by the majority ranged from 0% to 80%, in its examination of more than 180 physician burnout studies involving more than 109,000 individuals in 45 countries published between 1991 and 2018. The studies included in the analysis produced at least 47 distinct definitions of burnout prevalence and could not offer a clear consensus. "These findings preclude definitive conclusions about the prevalence of burnout and highlight the importance of developing a consensus definition of burnout and of standardizing measurement tools to assess the effects of chronic occupational stress on physicians," study authors concluded.